There are 3 certainties as we head into 2019; death, taxes, and the necessity for home improvement services. 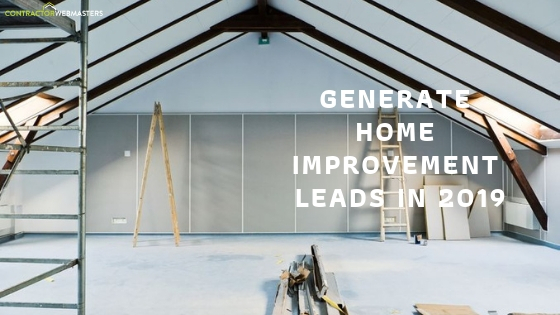 Contractors throughout the United States know the demand is great… the challenge is positioning oneself to be considered among the top tier of home improvement suppliers. Whether you provide plumbing, foundation repair, or home remodeling, there’s an avenue for online success in the upcoming year. Typically contractors have relied on digital marketing agencies or lead generation companies to assist in the customer acquisition process. With levels of varying success, some contractors have remained stuck in mud through 2018. Others have made significant gains and enjoyed notable surpluses in lead generation, sales conversions, and search engine ranking positioning. Contractors who fail are often mislead by questionable marketers with ulterior motives. But some of the onus must be placed on the home service worker themselves, as asking the right questions is something that’s within one’s control. What Does a Contractor Need Most? A website? No. SEO? No. A Google My Business listing? No. The answer to what a contractor needs most is much simpler; leads. That’s right, home improvement leads are the currency of every contractor’s promotional campaign. They are the direct conduit from a service offered, to a service sold. Websites, SEO, & Google My Business listings are tools to help a business generate leads, but they are only as valuable as their final result. Tools that fail to produce the desired outcome (leads) are clear losses, in both finances and overall business resources. Are Digital Marketing Agencies a Waste of Money? Digital marketing isn’t always what it is billed to be. There are a wide range of marketers throughout the U.S. and as is the case with any form of service, some are quite good, and some are intolerably bad. But to speak on the concept of digital marketing in of itself, it can be quite useful as an avenue towards lead generation. With that said, a services’ failure to produce leads renders it not only useless, but yields a negative ROI for your home improvement service company. Because of such uncertainty, digital marketing’s value depends entirely on the quality of the service. Are Lead Generation Services The Answer? Since leads are the foremost currency, it stands to reason why lead generation sites are the most practical investment for contractors. But that’s only for those who don’t fully grasp the nuance of lead generation platforms. The vast majority of them are more appealing in theory than they are in practice. Why? Because “leads” can be an ambiguous term, as not every so-called lead is the type that a contractor is aiming for. Shared leads, for example, are those that are given to multiple contractors, therefore diminishing their value, and decreasing the likelihood of their conversion. As a result, what contractors should really target are exclusive leads. Where To Get Exclusive Leads? The best place for exclusive leads brings us back to a concept discussed earlier in this post; digital marketing services. The best way to produce exclusive leads for your contracting business is to execute a successful internet marketing campaign, one complete with a custom website, search engine optimization, and Google Maps placement. Leads that come through organic web entities are exclusive by nature and hold the greatest value to businesses, both because of their convenience, and their exponentially greater probability of conversion. The caveat is that executing a triumphant marketing campaign is easier said than done, and traditionally presents a substantial risk of failure and subsequent loss of financial resources. SEO agencies and lead generation platforms are both imperfect, but each of them represents part of a contractor’s ideal marketing scenario. On the one hand, SEO companies are the most likely to produce exclusive leads, which is the currency most coveted by contractors. On the other hand, lead generation platforms offer the superior payment model, as the contractor pays only for leads, rather than the process of trying to secure them. Both often fall short of achieving their goals. SEO marketing that doesn’t generate leads becomes money wasted. Similarly, lead generation investments that produce low-quality, shared leads becomes negative ROI. For the first time ever, there is a marketing service that combines the best of both concepts. It is Pay Per Lead (PPL) marketing from Contractor Webmasters. With PPL marketing, contractors receive all the perks of a full digital marketing campaign with a payment model that more closely mirrors lead generation platforms. The result is a low-risk, high-reward proposition, where contractors receive a custom, SEO-friendly website, Google My Business & Maps listings, and ongoing web development, with ZERO money down. It is only once an exclusive lead is generated as a result of the services, that the contractor than submits a payment for that lead. All leads are screened to ensure proper attribution… so that contractors are charged only for leads that are acquired as a result of Contractor Webmasters’ services.